An errorless learning procedure was used to teach discrimination to two groups of children with learning disabilities, one composed of children with Down syndrome, the other of children without Down syndrome. Both groups responded positively to errorless teaching, with the children with Down syndrome requiring fewer training trials and showing better retention of the target discrimination than the children without Down syndrome. The errorless technique proved to have little value in teaching children with Down syndrome discrimination skills per se, however, since they showed little evidence of any transfer of learning to a second discrimination task. Errorless teaching strategies may nevertheless have an important role to play in increasing motivation to learn in children with Down syndrome, being most effective when used in conjunction with conventional trial-and-error methods. Duffy, L, and Wishart, J. (1994) The stability and transferability of errorless learning in children with Down syndrome. Down Syndrome Research and Practice, 2(2), 51-58. This study provides an evaluation of the short-term memory performance of children with Down syndrome (DS) and children with intellectual disability of other etiologies (ID/OE) on the Stanford-Binet 4th Edition (SB4). Results revealed a significant difference between the two groups for short term memory scores on the SB4, indicating that on short-term memory tasks children with Down syndrome function at a significantly lower level, than a group of intellectually disabled peers with other etiologies. Differences between visual and auditory short-term memory sub-scores for the two groups also were identified, with significantly lower scores for auditory short-term memory for the group with Down syndrome. Finally it was established that while the SB4 appears to be a suitable instrument for the identification of intellectual disability, the test is limited in its range of short-term memory subtests for young children with Down syndrome. Bower, A, and Hayes, A. (1994) Short-term memory deficits and Down syndrome: A comparative study. Down Syndrome Research and Practice, 2(2), 47-50. Two-hundred and one adults with Down syndrome, living in the hospital and community, were assessed to ascertain prevalence of medical problems. Eighty-one percent of individuals examined were found to be overweight or obese (BMI >24), significant impaired vision was present in 18% and significant impaired hearing in 12%. A further 12% had a cardiac murmur and 15% of males had an undescended testis. Flat feet were found in the majority of subjects (70%) with xerosis in over a third of subjects (39%). A low heart rate and low blood pressure recordings were typical findings. A history of epilepsy was found in 8% of subjects. Particular concern needs to be given to obesity, sensory impairment and thyroid dysfunction and regular screening of all adults with Down syndrome is recommended. Prasher, V. (1994) Screening of medical problems in adults with Down syndrome. Down Syndrome Research and Practice, 2(2), 59-66. Prasher, V. (1994) Prevelance of thyroid dysfunction and autoimmunity in adults with Down syndrome. Down Syndrome Research and Practice, 2(2), 67-70. A longitudinal study was conducted to investigate the early language development of children with Down syndrome. Using parental records of their children's speech, the study investigated very early language development, from first words to the consolidation of two-word phrases. Seventeen children were studied, all with Down syndrome and the age range of these subjects when the study began was one year to four years. The mean age for reaching the ten word stage was 27.3 months, a delay of around 12 months. The results showed that the children with Down syndrome studied here learned very similar words to those of typically developing children. The results also indicated that, as with typically developing children, some children with Down syndrome experienced a vocabulary explosion. The mean age for this language explosion was 30 months, with a mean vocabulary of 24.4 words. However, it was clear that there was a wide range of individual differences with some children showing no explosion. The mean age for two-word phrase consolidation was 36.9 months, suggesting a delay of around 18 months. 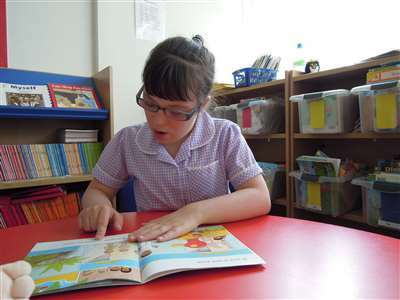 The results indicated that, having reached the ten word stage, children with Down syndrome proceed in their language development at a slower rate to a two-word stage than typically developing children. Detailed individual profiles are included to illustrate the wide range of individual differences observed in the rate of language acquisition in this group. Oliver, B, and Buckley, S. (1994) The language development of children with Down syndrome: First words to two-word phrases. Down Syndrome Research and Practice, 2(2), 71-75. Providing a Speech and Language therapy service to children with Severe Learning Difficulties (S.L.D.) offers much opportunity for multidisciplinary work. This summer I decided to take advantage of the links with Drama Therapy and run a short course of five weekly sessions for a group of seven children with the aim of developing communication skills through the use of drama. Five of the seven children had Down syndrome and all were integrated into local mainstream schools. Chatterton, S, and Butler, S. (1994) The development of communication skills through drama. Down Syndrome Research and Practice, 2(2), 83-84. The aim of this study was to investigate the acquisition of grammar in children _ with Down syndrome, in particular to look at the production of morphological rules (stated by Brown 1973), and onset ages at which they are acquired in their language. In a study of three children in the United States, Brown found that between the ages of 2 and 4 years, typically developing children gradually incorporated a variety of different morphemes in their speech. Although there was little correspondence between the inclusion of separate morphemes and chronological age, there was a strong similarity in relation to the sequence in which the different morphemes appeared in their speech. In this longitudinal study the children with Down syndrome produce their first 10 words on average 12 months later than typically developing children, then the majority of the early morphological rules were in fact acquired by the children with Down syndrome, at a similar rate to typically developing children. This therefore would suggest that once the children with Down syndrome get going with the production of language, they in fact show a similar pattern as typically developing children in the early acquisition of grammar. Rutter, T, and Buckley, S. (1994) The acquisition of grammatical morphemes in children with Down syndrome. Down Syndrome Research and Practice, 2(2), 76-82.